Drafting tables provide essential workspace for architects and designers in all fields. 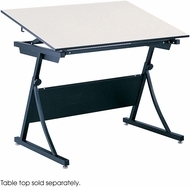 Office Chairs Unlimited offers a wide variety of stylish, functional drafting tables. Featuring a full range of tilt and height options, these tables can be outfitted with the desktop of your liking. Comfort and style combine perfectly in these drafting tables.